And if you're currently in the throes of wedding planning, there's quite a few deals out there to be had - not least with one of the big ticket items on the list! 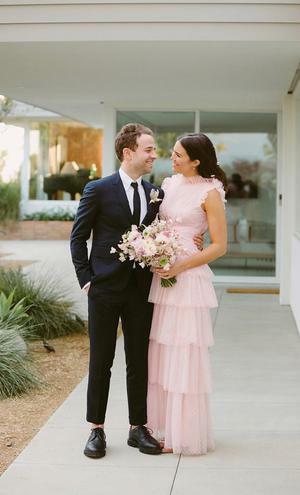 We've been browsing the latest sales on wedding dresses from the likes of Catherine Deane and BHLDN, but it was only when, inspired by the beautiful Mandy Moore's sweet vintage wedding look earlier this week, we came across the best celeb designer wedding dupe yet. And the clincher? It's currently in the Black Friday sales! Result! Of course Mandy's full tiered 70s style tulle wedding dress isn't for everyone, but for boho brides looking to shake up wedding norms by injecting a bit of colour into the wedding getup, it's the dream. The dupe we've found is by celeb-fave little house on the prairie dress label Needle and Thread (but of course) and is a double of Mandy's romantic pink Rodarte. The Scallop Tulle Gown from Needle & Thread comes in white and rose quartz (the rose quartz being the one most akin to Mandy's gúna). It was €485 and is now €245, and you can get it on needleandthread.com while stocks last (they ship to ROI). 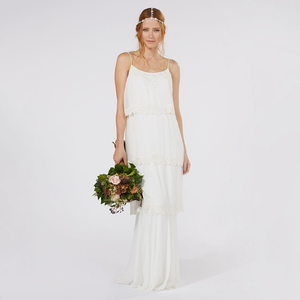 If you love Mandy's look we've found a couple more 70's style boho gowns that are well worth a look. View the gallery below.